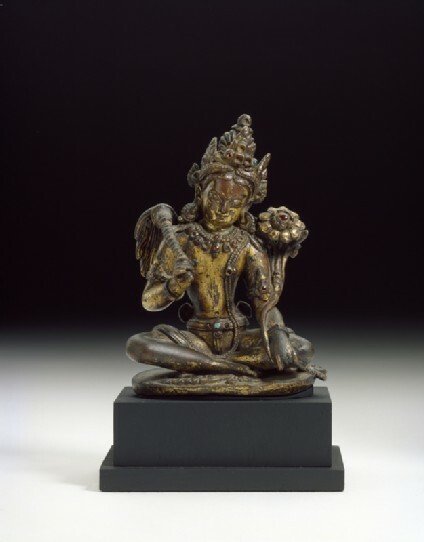 This very refined image of Padmapani (‘Lotus-in-hand’: an aspect of the Bodhisattva Avalokitesvara), together with a matching Vajrapani figure, originally flanked a larger image of Vasudhara, goddess of prosperity and wealth . The use of gilt copper and inset cabochon stones, the graceful modelling, and the serene expression of this image are characteristic of sculpture of the early Malla period. In Tibetan Buddhist iconography, Avalokitesvara assumes the aspect of a benign demeanour and white body colour, holding a fly-whisk and lotus, when acting as an attendant to the Buddha Sakyamuni or the goddess of long life Ushnishavijaya . In Nepal, the same aspect is also found, as here, when Avalokitesvara attends Vasudhara. Padmapani gazes gently downward, his face inclined slightly to the right. His seated posture is perfectly balanced, his ankles loosely crossed beneath him and the right shoulder aligned slightly forward. His left hand holds the stem of the jewelled lotus, while his raised right hand holds the yak-tail fly-whisk which trails over his shoulder, covering the rear of his upper arm. The image is as finely modelled at the rear as in front. The chignon has high and intricate coils, the hair is carefully combed in vertical lines above the crown band; below the band it is combed diagonally to form trailing plaits. The crown has three vertical panels, inset with rubies and semi-precious stones to create a geometric pattern, and two lateral fans, formerly also inset with stones. There is no image of Amitabha in the crown. The earrings are concentric discs with beaded edges and a single suspended bead. The necklaces are strands of beads with a central stone and a second strand with several stone pendants. The beaded sacred thread was also inset with a stone in mid-torso. The waist is very slender, slightly inclining to the left, while the hips face forward. The flat abdomen is emphasized by the inset turquoise and rubies of the belt, which circles the hips and is tied at the back with two hanging ends. The dhoti has an imprinted pattern of diminutive circular florets. A sash is draped over the thighs and below the hips at the back; it is knotted at the back of the left thigh, the ribbon ends falling behind the leg, while the other end of the sash protrudes beneath the right foot. The separately made, copper repoussé lotus pedestal, now detached from the image, has suffered damage to several of its petals at the front and rear . 1 All three sculptures are published by von Schroeder, Indo-Tibetan Bronzes, nos. 93A–C (the present image is 93A). The Vasudhara is now in the Museum Rietberg, Zurich (Berti Aschmann Foundation of Tibetan Art): Uhlig, On the Path to Enlightenment, no. 97; the Vajrapani is published in Weldon, 'Tibetan Sculpture Inspired by Earlier Foreign Styles', fig. 10; see also Introduction above, figs. 21–2. 2 de Mallmann, Iconographie du Tantrisme Bouddhique, p. 106. 3 Acc. no. ea 1993.381b.